Many people believe if they just fit a seal kit in their unit it will solve all their hydraulic down time problems. Although there are some occasions where a seal kit only repair is required, usually you will find there is another reason for your seal kit failure. The most common reasons for your seal kit to harden is purely age and heat - this causes the modular strands to vulcanise leading to a hard inflexible seal. All the above reason can cause damage to the rest of your unit and can end up being very costly if not resolved. I will put to you an argument for and against a seal kit only repair and let you decide what would be best for your unit based on some fact and opinions of people trained in the hydraulics industry. As above the main reason to avoid a seal kit only repair is the fact that 9 times out of 10 there will be an underlying cause for the leak and avoiding getting your unit properly inspected and repaired will only end up costing you more in the long run. As you may or may not know if you do send a unit in to your hydraulics company for a re-seal it is not uncommon for other components found to be damaged in the process and these will need replacing, the most common item found to be damaged in this process is the bearings as they fit so closely to the seal kit. A pump develops a leak - but why? At Hydraulic Pumps (UK) Ltd we get many phone calls from customers requesting a re-seal as their unit is leaking. Through experience we have learned this is usually not just caused by the seal kit. Over 90% of seals in pumps and motors are static, in that neither face they seal to move. Shaft seals are the most obvious exception. If an old seal will still do its job there must be another reason for it to leak - the most likely reason is an increase in case pressure. So what can cause this increase in pressure? The simple answer is internal wear leading to a loss of performance and high internal leakage: fitting new seals may in the short term seal the leak but it will soon return. 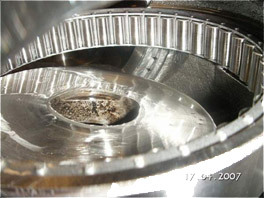 Another contributing factor is a restricted case line: this will cause a high case pressure, not only will the seals be damaged but further damage may be done to the main rotating parts of the pump leading to a major failure. What can I class as a major failure? If your unit has suffered catastrophic failure oil will pulse into the case creating a pressure spike that cannot be accommodated by the drain line. The next weakest point will often give way, usually a body seal or shaft seal. So what if my shaft seal fails? 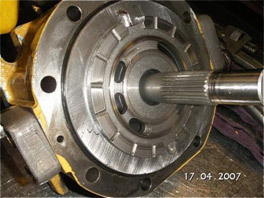 A hard shaft seal will wear the metal of a rotating shaft producing a groove which, due to the loss of flexibility cannot be taken up by the seal. In this case a replacement seal will only be damaged by the worn shaft, only lasting a short time. In all the cases above a leak is only due to a further deeper problem developing. A quick re-seal should only be seen as a short term stop gap solution, while the underlying problem often remains. Only a full service by qualified personnel will return the unit to its original condition. So why do old seal kits still seal? It is advisable to get your unit checked out for any faults after roughly 3000 - 5000 hours of use. So when is it advisable to re-seal only? Please note: when deciding if just a quick fix if really worth it you should also be aware most reputable hydraulics company will not offer a warranty on a re-seal. So to seal or not to seal - you decide! !